OFFICIAL COOZIE/COZY AND/OR SLEEVE WRAP-UP SUPER POST!!!! Here it is, the OFFICIAL COOZIE/COZY AND/OR SLEEVE WRAP-UP SUPER POST!!!! One of our favorites for the hand made category because, really, who doesn’t like Pendleton wool? Our pal Michael Parich hand makes each one of these, and can make them out of a variety of different Pendleton patterns. 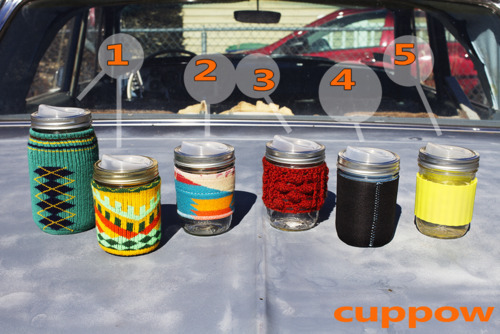 He stitches a cool rubbery elastic strip onto the inner surface, so that it is sure to hang onto your canning jar! Our friend Danielle sells these cozies (pictured, #3) at Sherman Market in Union Square of Somerville, Massachusetts, and on her website at Crochetcore. Prices vary from $6-8, based on the style. 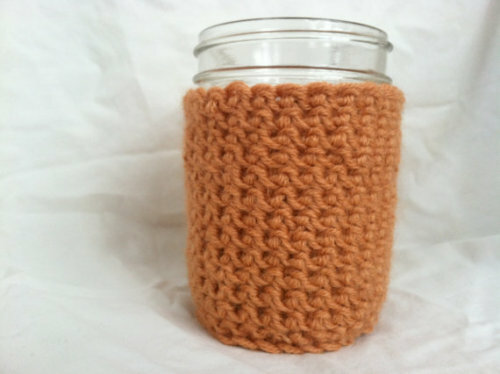 A Yellow Kitchen offers pint and quart sized cozies (not pictured), most with bottoms, which is kind of rare for knit cozies. Hannah makes these out of some really nice materials. Hand wash and they will last for years. Most are $8 on her etsy page. 4. Garbage Generic Neoprene Beer Coozie - FREE! Yeah, that promotional beer coozie that you got in college or at the bar from the booze rep will stretch over a pint-sized canning jar just about perfectly. If you are not into whatever the advertisement is, just turn it inside out like we did for the photo. Neoprene probably has the best insulating properties of any coozie on the market (lol @ science)…and remember these are FREE. We walked to our corner liquor store and they gave us three…for nothing! Also in the FREE category falls: that old NBA wristband, a wool sock, sleeve of a sweater, a bandana, and a cut-off wrist from a wool glove. It’s just about how creative you want to get. We hope that you have enjoyed the OFFICIAL COOZIE/COZY AND/OR SLEEVE WRAP-UP SUPER POST, and make sure to Tweet (@cuppow), Tumblr-ize (cuppow.tumblr.com), or facebook (facebook.com/UseCuppow) those pictures of your coozie/cozy/cozie/sleeve solutions and your Cuppow in action! !